BROGAN NUGENT: I 💗 Vintage. Hello Humans! I hope you're all doing well. Today I thought I'd show you three vintage-style things that I have been loving recently. My Polaroid Camera. I've had this since 2013/2014 and I go through a routine; one second I love it, and then I lose interest. At the moment, this is a MAJOR LOVE. I've had a fascination with Polaroids from a young age, when I saw pictures from my parents when I was young, and for years, I found myself looking in camera shops at Polaroid Cameras. Eventually I bought myself a Fujifilm Instax Mini 8, and I fell in love. Although, I'm most definitely not an expert, and probably A LOT more practice. However, I love the concept of taking the photo, it developing and then you get it instantly. I think it's when I'm sitting at my desk, working on blog posts, writing my book, it's a bit of a fuss to stand up and turn it over after a few songs. But now that I've added it, tonight I WILL be listening to Ed on my Record Player. This one is a little different, because this isn't an actual object that's vintage. Instead it's a video editing effect. I LOVE the old classic VCR-style videos, and this year, I'm going to be working on different videos for birthdays, etc. that I'm making for myself. And I found a tutorial on YouTube (can't remember where from, sorry! ), and I put it together, and it just works so well! And in honour of vintage, here's a picture of myself and my best friend Phoebe when we first met. LOL. 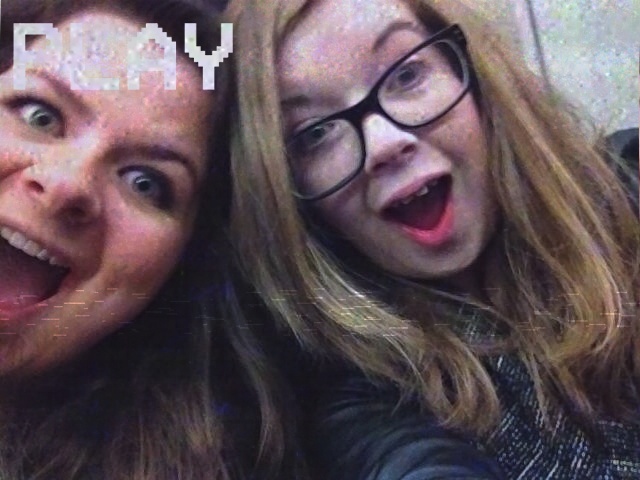 It's our five year friendaversary on Saturday (7th April), so HAPPY FRIENDAVERSARY TWIN!